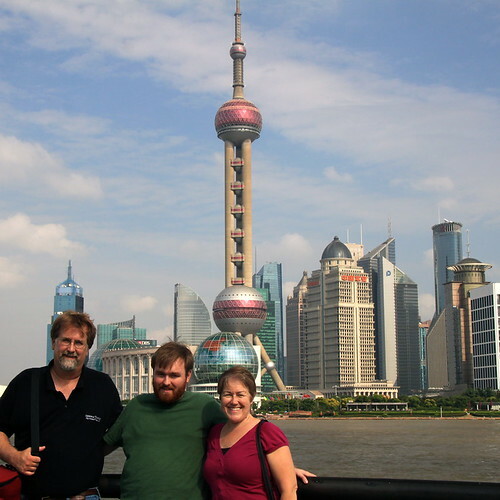 Hear about travel to Shanghai, China as the Amateur Traveler talks to Charissa who is an American living in the city. Carissa starts us in the very modern district of Pudong with its skyscrapers. It includes the new area that is the usual picture of the Shanghai skyline. The iconic Pearl Tower with the ball at the top is in Pudong. In the bottom of the tower is a Shanghai History Museum which she recommends more than the tower itself. The tallest building is the Shanghai tower. She recommends the bar on the 80th floor of the Jin Mao Tower for a nighttime view of the city. For the oldest, although touristy, part of the city you can visit the Yu Gardens which are from the Ming Dynasty. 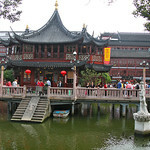 There is a well-known tea house there and lots of stores for tourists to shop in. There are also some nice restaurants in that area. Carissa also recommends you visit a park and her favorite is Fuxing Park. Walking around in a park in China will expose you to the local culture. You will find old women doing their exercises or children in the play areas. Nearby is one of the few areas that preserves the old Shikumen style of architecture. You can get lost in the little alleys with restaurants and art galleries. Nearby Shanghai are some beautiful cities built around canals. These are easy to reach on high speed train. Shanghai is a large city with 24 million people but it is a very safe city. It is easy to get around on the subway or in cabs, but make sure you have the address of where you are going in Chinese. There are museums and a wild animal park. There is shopping and lots and lots of people watching in Shanghai. Another memorable episode taking me back to my youth. My Great-grandfather came from Denmark. What always makes me smile is the mention of Lego Land. In 1977, my parents would not take me to Lego Land. We went to Rebild National Park instead. Rebild is Denmark’s “first” national park. It’s a memorial to Danish Americans and includes a replica of Abraham Lincoln’s log cabin. I always felt cheated. Needless to say, I got to Lego Land in California some 20 years later! Hey Chris, the show rocks. I listen on my commute every day. I’ve been working in China for almost six years now so I especially love the China episodes. You and Jessica spent a minute discussing tools and resources that make it easier to travel in China. I want to add Apple Maps to those resources for any future travellers. You can use it all in English and you can even use the public transit option on it if you want to avoid taxis. I’ve been to some small and out of the way cities and Apple Maps has never failed me. Apple has done such a good job with it that I will stick exclusively with iPhones as long as I’m here. And another great app for China is the trip.com app. I thought it worth mentioning as I listened to the Xian episode. Again it’s in English and you can look up the train route you want, choose the train you want, and show the people at the ticket office to make it a little easier. I hope this helps some people visiting China in the future. My wife and I really enjoyed your recent podcast on travel to Shanghai. We agree that the experiences mentioned in the podcast are really worthwhile things to do while visiting Shanghai. We also agree that Shanghai is not really the place to experience the history of China, but rather the place to see the new and emerging modern face of China. One experience that we enjoy when we visit Shanghai is the river cruise that departs from the Bund on the Huangpu River. There are many options, but we especially like to take the twilight cruise. When the boats leave before dusk, it is still daylight in Shanghai, but as they turn and head back down the river you begin to see all nighttime lights of Shanghai. The contrast between day and night creates an incredible dramatic experience. It is also exciting to view the difference between the traditional buildings on one side and the modern structures on the other side of the river. The visual spectacle of the lights of Shanghai is something that we never get tired of seeing. An additional experience that is currently very popular in Shanghai is visiting the new Disneyland park. My wife and her family had the opportunity to visit during the last week of May and found it to be a delightful mix of traditional Disney attractions combined with references to Chinese culture. The cost of park tickets varies depending on the day of the week and the time of year. On the day my wife visited, her party found the park to be very crowded. They also found that by the time they arrived around 10 AM, there were very few Fast Passes available for the rest of the day. Their solution was to purchase a Disney Premier Access Ticket for each person that gave them an instant one time Fast Pass for nine different attractions. This was only available for purchase through the Shanghai Disney Resort App after they entered the park. The Disney Premier Access Ticket allows visitors the option buy anytime Fast Passes for individual attractions or a Fast Pass that covers all the attractions at a discounted price. Even though this almost doubled the price of their admission to the park, it did allow them to see all the major attractions in Shanghai Disneyland in one day. They felt it was well worth the cost. Like everything in China. It is really worth taking the time to educate yourself about all the options you have when visiting an attraction or area. The Chinese have different ways of doing things than we do in the United States. Again, thank you for this wonderful podcast on Shanghai.